hey my dad has a kawasaki and you guys are the best with ths stickers so can you send me a sample sticker for my dad so he can see if he wants a kit. The Factory Effex Kawasaki Sticker Kit has not been rated. 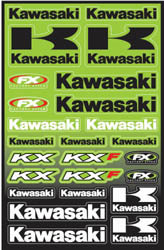 Be the first to rate the Factory Effex Kawasaki Sticker Kit. Earn rewards by rating products.